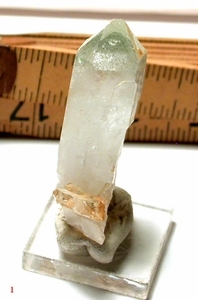 An Arkansas green-and-buff chlorite phantom, [rare] shield faced crystal, slightly flattened with rider crystals, veils, and selectively chlorite-etched faces has rainbows and read-through clear areas not in the photos. Fine miniature with growth craters and record keepers, it's 5/8x 1-1/4x +2" tall. No damage.